Julius is a freelance writer and also a part-time coroner in the Yukon. He was born and raised in Germany and holds a B.A. in history (with distinction) from Athabasca University. Eventually, of course,-Julius says "I would like to write full-time." This article was first published in "History Magazine" Oct./Nov. 2002 issue, where I first read it and knew I wanted to share it here at the Stump Ranch. It gives a terrific overview of pioneer womens contributions to the making of the west, which used to be highly overlooked in the history books. 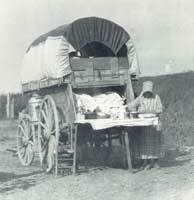 The Canadian and American societies of the 19th century were very mobile societies. While urbanization no doubt accelerated in the 19th century, more than half the population lived on farms. The mobility had begun in the mid-18th century, when parents in the eastern part of the country could no longer provide their children with land nearby. Land was in short supply and the soil was being depleted. New immigrants and "old farmers" alike started to move west and founded new settlements along the way. Conditions were grim, and women contributed a great deal to the family economy and probably made survival possible. The vast majority of the farms in the time period under discussion were family farms (subsistence farms). This meant that all family members capable of doing so had to participate in the farming operation. While children were certainly required to help, it was the farm wife who played a major role in keeping the farm running. 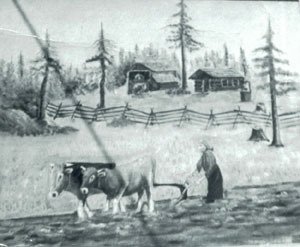 Etta Savage plowing the field on their property in Birdsview, early 1880's-property still in the family (since 1878) by Savage descendant Barb Thompson- picture is painted from memory by John Savage, picture courtesy of Ted & Betty Savage. When a farm was first established, it was not unusual for the farm wife to work in the fields alongside her husband. This included such work as picking rocks from the fields, helping to seed grain, milking cows or goats and looking after livestock. She was the midwife for livestock, hand-raised abandoned newborn animals, and helped bring in the harvest in autumn. If all went well, she could eventually stop doing that and concentrate instead on managing the household. 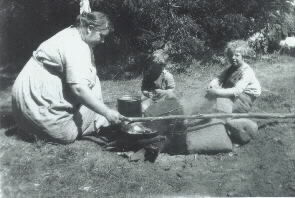 This did not mean, however, that she could now lead a life of leisure in fresh air; her job was still important to the survival of the farm and its occupants and now might include extra cooking and cleaning for hired hands. Early farmers and their wives had to endure isolation. Even if they had neighbors, they were usually situated a long way from villages where provisions could be bought. In addition, the roads leading to these villages were very poor, making the delivery of ordered provisions a rather chancy business. Besides, quite often certain items were not available at the store even if the roads permitted delivery. Thus, farms had to be as self-reliant as possible. It was up to the farm woman to procure provisions; many items, however, she had to produce herself. In her book Clearing in the West (Toronto, Canada: Thomas Allen & Son Limited, 1976) Nellie McClung explains how her mother made soap--even the lye used in the process was homemade. Indeed, it seems that women were very proud of their own soap, and McClung points out that she was sorry for the little girls who had to use the "boughten" kind because their mothers didn't know how to make soap. Other items more often made at home than bought included butter and vinegar, as well as jams, jellies, hams, sausages, and all baked goods. That alone was a lot of hard work. Butter was usually made once a week, especially in the summer, when much of it was put in crocks for winter use. First the cream had to be separated from the milk. This was done by pouring fresh milk into shallow dishes and keeping these in a cool place. Twelve to 24 hours later the cream, which had risen to the top of the milk by then, could be skimmed off. The cream then had to be heated to about 60 degrees Fahrenheit; less heat than that meant the butter had to be churned longer, more heat resulted in soft butter that kept poorly. The heated cream was then churned in wooden churns. These, the fancier ones of which had glass lids, were hand and foot powered. Once granules had formed, the buttermilk had to be drained from the churn. Next the butter had to be washed, which could be done in the churn or on cheesecloth in a colander. Either way, lots of fresh water had to be hauled for this part of the job. The washed granules were then salted and worked together with a wooden spoon or butter paddle. The finished butter was wrapped or placed in crocks for storage, although some women would shape the butter in molds before wrapping. Vinegar was available at most general stores, but many women made their own. For this they mainly used apples. The process was simple, though time consuming. First they ground the apples into pomace. This they placed into an oak tub with a drain hole at the bottom, put the pressing plug and pressing screw into place and tightened the screw down. They then waited for a while before tightening the screw more, repeating this process until the last drop of juice had been squeezed from the pomace. They filtered the cider through cheesecloth several times and poured it into bottles or jars. The cider could be used at once, sealed for later use, or kept open at room temperature. Cider kept open would ferment and turn into hard cider in about five weeks, after which it could be sealed air tight and kept for many months. If the women left the hard cider standing uncovered, it would soon form into cider vinegar. 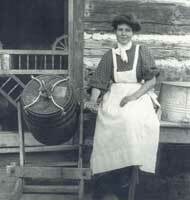 For jams, jellies, and fruit butters farm women used fruits and berries they cultivated or picked in the wild. A hot and time-consuming job, preparing fruit preserves allowed them to serve sweets in the winter without having to buy them at the store. Many of the fruits and berries grown on the prairies, such as sour apples, crabapples, blackberries, cranberries, and loganberries did not need additional pectin to produce jelled preserves. For others pectin was necessary. This the women could also produce themselves by simmering quartered tart apples with cores intact for half an hour and draining them overnight in jelly bags. The juice gained in that manner was then boiled down until only pectin remained (three quarts of juice would yield about two cups of pectin). Meat also had to be safely stored for prolonged periods of time. The easiest way to do this was by brine-curing or dry-curing. Brine-curing was done in crock pots or hardwood barrels, in which the meat was kept submerged in salt brine. After the meat had been curing for about five days, it was removed from the brine, and scum was ladled off. The meat was then repacked in the brine until it was cured to taste. After that, the women rinsed the meat, hung it to dry in a warm place, and then stored it hanging until used. Dry-curing was accomplished in wooden box containing wholes in its bottom to allow drainage. A mixture of salt and spices was rubbed directly into the meat before it was placed into the box. Once the first layer of meat was in the box, the salt and spice mixture was added until all the meat was covered. The next layer of meat was then added, and the procedure was repeated until the box was full. Meat thus stored kept very well, as long as the salt and spice mix was replenished when necessary. For a long time salt curing was the most popular and easiest way to preserve meat. Hams and other cuts of meat were also cold smoked for long-term preservation. A proper smoke house or cold-smoker fire pit was needed for this, and it was crucial that the temperature did not exceed 110 degrees Fahrenheit (except for very large hams). Sausages were also often smoked, and when made from cured meat they kept very well. Making them, however, was very labor intensive, since the intestines from freshly slaughtered animals were used as casings. These had to be carefully cleaned, scraped free of fat and mucus on all sides, and rinsed repeatedly in water until the water remained clear. The intestines were then stuffed with the sausage mixture (ground up meat, spices and dried herbs, fat) by way of stuffing tubes. Cleaned intestines not immediately used as casings could be stored in brine until they were needed. Clothing was expensive, and material for clothing items was bought at the general store instead (of course, clothes were handed down from older to younger siblings). To make their own cloth, women spun yarn, then dyed it and sewed the clothes needed by the family. By 1856 chemical dyes became available, but many women still used natural dyes, such as onion skins, walnut shells, tea leaves, white maple bark, and lye and copperas. Spinning was done by means of a drop spindle or, if a woman could afford one, a spinning wheel. Of course, the fleece had to be cleaned before teasing and carding prepared it for spinning. Stockings, mittens and scarves were knitted, as were comforters. Some women wove their own cloth, often using simple handlooms to do so. Although extremely time-consuming (to fill enough bobbins with weft for a five-yard length of cloth could take a whole day, while measuring and putting the warp string on the loom for the same amount of cloth could take several days), plain-woven wool and linen garments were popular. A favorite for women's dresses was a mixture of wool and linen called "linsey-woolsey." The ability to do needlework was highly prized, and those not handy with yarn or wool were made to feel somewhat useless. Nellie McClung gives a good example of this in Clearing in the West. It seems that the girls at the school she joined were doing "fancy work" with knitting needles and crocheting hooks (creating table mats and lace for underwear). When Nellie wanted to try her hand at crocheting, she realized it was much more difficult than it looked, and no matter how hard she tried, she simply could not do this kind of needlework. She consequently tried to show her disdain for "fancy" underwear but admits that she was embarrassed and saddened by her inability. One of her schoolmates tried to comfort her by saying one of her mother's friends could not do "fancy work" either, but that this was okay-the poor woman couldn't help it since her father and mother were cousins. The farm woman was also the trader of goods. Although busy enough in the house, she was required to haul water, milk the cattle, feed the pigs, and tend the chickens. Butter and eggs were then sold, most often to the general store where she bought those items she did not or could not produce. The money thus made paid for living expenses, and this allowed the income from cash crops to be used to run the farm and buy new equipment and livestock. Some items were also traded for necessities not on hand--traded to neighbors or Indians who visited the farms for that purpose, or even the store keeper. Extra income was always sought after, for the cash crops did not generate a great deal of money. Thus farm women would often do the laundry for bachelor neighbors. Daughters might work as hired hands for other farmers; if this was not possible, they would work in town or as teachers to supplement the family income. The women had to perform veterinary duties as well. In the rugged terrain occupied by farmers even animals had accidents, while wild animals or dogs running free injured others. Veterinarians were unavailable in the mid-19th century, and the care of injured animals was delegated to the women. Although crude methods were combined with a lot of prayers, women did admirable jobs of keeping animals healthy and treating the sick ones. Of course, human beings also had accidents or got sick. Isolation did not permit a quick visit by a doctor, particularly when the weather was bad. Again it was the farm women who took on the roles of physician and nurse. It was for that reason that they were always looking for new and better medicines to add to their stock of herbs and salves. One can hardly imagine how tiring it must have been to look after very ill family members, how physically and emotionally demanding. In addition to illnesses women also had to cope with childbirth in very primitive surroundings and mostly without the help of doctors. 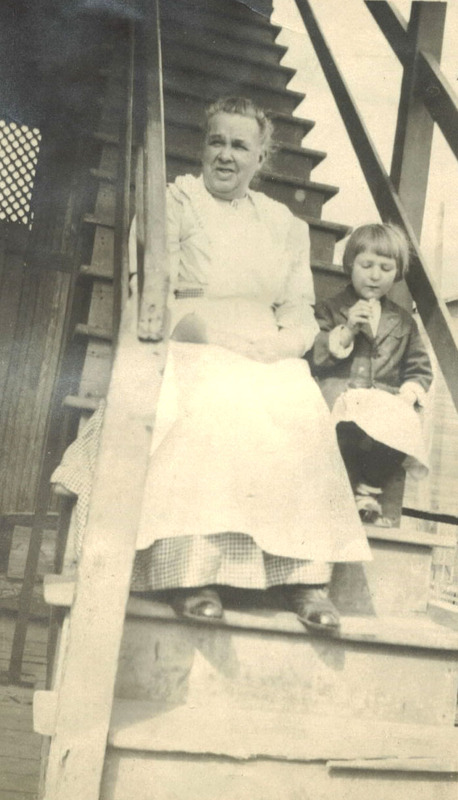 Grandma Etta Savage -after a lifetime of pioneering and hardship-taking a rest with a granddaughter Zola. Women, then, were crucial to a farm's existence. They were the source of the cheapest labor, and their work not only kept farmers and their children clothed and fed, it also provided the money to keep the household running. Of course, a bachelor farmer with money could always hire a woman to do the laundry, and he could buy his clothing in the store--although I doubt that there were many single subsistence farmers with that amount of cash. But even if money were no object, how would these men have dealt with the isolation and loneliness, which was very tough even on whole families? How would they have dealt by themselves with sickness in a location where even a minor injury could spell disaster? The women's role during this period should not be underestimated. Without them, settling the West would have taken much longer--if, indeed, it would have been possible at all. SIDEBAR FOR "THE CONTRIBUTION OF FARM WOMEN IN THE NINETEENTH CENTURY"
Soap making was an art, and turning out a good product took time, and the end result was not guaranteed to be good. Hence, it was considered good manners to wish soap makers good luck and God's blessing. Yet, not all women embraced store-bought soap, which tended to be hard because it was made from commercial lye. There were many recipes for different soaps, and the better ones were passed on from one generation to the next. What, then, was involved in the process of making soap? The basic ingredients for any soap were water, fat, and lye. It was best to use collected rain water, since much of the well water available to settlers was quite hard. Procuring fat was fairly easy-any fat from a slaughtered animal not used for consumption was saved for making soap. Since most of the butchering was done in the fall, that was also the favorite time for making soap. The important point in preparing fat was to render it slowly without letting it smoke or burn. The ideal combination was half tallow (beef fat) and half lard (pig fat). Once liquefied, the fat had to be strained. Producing lye was more involved. The main ingredient for lye was wood ash, preferably from hardwood such as fruit trees, oaks, beech, and ash, since these woods produced the strongest lye. Since nearly all settlers heated and cooked over wood fires, ash was plentiful. But how was ash turned into lye? The first thing needed was a wooden barrel with a hole drilled in its side as close to the bottom of the barrel as possible. This barrel was placed on supports high enough to allow a crock or enamel pot to stand below the drain hole. The bottom of the barrel was then lined with straw to filter the ashes, and the barrel was then packed with wood ash (tightly packed ash resulted in stronger lye but prolonged the process). Then water was poured over the ash, and when it had all seeped away, more was added. However, the process was not hurried along-depending on the barrel size and the amount of ash, it could take days before the lye flowed out of the drain hole. This lye could be used directly for making soap, or it could be boiled down until it crystallized and formed potash. Both lye and rendered fat hat to be the right temperature (between 95 and 98 degrees Fahrenheit). The fat was poured into a large enough container, and while stirring it, the soap maker would add the lye solution in a steady stream. Once the mixture reached the consistency of sour cream, colorants and scents could be added, and it was then poured into dishes or molds for cooling (often a large block that was later cut into bars). Cinnamon was one of the favorite scents, as was "perfumed soap," which simply contained some oil of bergamot, oil of clove, oil of thyme, oil of sassafras, and oil of neroli. Color, if desired, was achieved by adding spices or infusions made from roots, flowers, or vegetables. All additives were stirred into the mixture before it was poured into molds. Special purpose soaps were also made; for example, and addition of oatmeal or cornmeal produced "grease remover," while the addition of mercury chloride made for a rather dangerous concoction to fight "the itch." McClung, Nellie. Clearing in the West. Toronto, Canada: Thomas Allen & Son, Limited, 1965. Traill, Catherine Parr. The Backwoods of Canada. Canada: Simon Fraser University, Athabasca University Course Reader, 1985. Robertson, Heather. Salt of the Erath. Toronto, Canada: James Lorimer & Company, Publisher, 1974. Abrahamson, Una. God Bless our Home. Canada: Burns & MacEachern Limited, 1966.